Trying to Catch Myself Before I Fall. Hey kids! I know it’s been awhile. the truth is I got distracted by a boy. A very beautiful charming boy…okay, a man really, who is now far far away again and I’m sad. I can’t quite tell you what it was that made me fall (not even sure if it’s a true fall). I’d like to blame it on the distance as I seem to have a problem with liking unreachable impossible relationships. We don’t need a psychologist here to figure out why this is true. Why is he so cute? Why is he so funny? Why is he so smart? Make it stop!!! Ugh. I’m mostly irritated at myself for allowing this to happen. I should have known better. So the plan is to give it time and see if it prospers or withers up and dies. I feel the door is slightly ajar and I am at the point where I can’t decide if I’d prefer to open it all the way or slam it shut again. I will say that I spend too much time contemplating and planning my social relationships and I need to take a step back and focus on myself. It’s annoying because I’ve known this for months and yet I can’t get myself to do it. Changing habits and actually taking time for inner reflection are both frightening yet necessary. Also, on an entirely different subject. I’ve been contemplating getting a tattoo. Mom, don’t freak out–I know you said you’d cut me off and disown me etc. etc. but I am 27 now and it wouldn’t be tasteless. The likelihood that it will happen is at about 31% and it wouldn’t be for like a year because I’m still trying to figure out exactly what I’d want it to look like. I know that I’d want it to be a fawn. You know, like my middle name. Pretty simple, maybe it’s corny, but it’s the only thing that makes sense to put on my body permanently. This is not a fawn, I hope you all knew that. But I like the silhouette style, maybe. 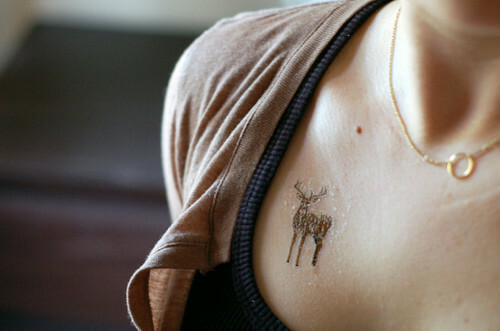 Or I could get a whole sleeve with a fawn in the wilderness and stuff? If nothing magical and life-changing comes out of it I at least now know about this band and have become rather obsessed with this song.